1717L – 17.0″ 1280 x 1024 TFT, 800:1, AccuTouch, Serial/USB, Antiglare The 1717L touchmonitor is built to withstand the rigors of continuous public use with a rugged “built for touch” design. Its stylish, thin and modern look is coupled with a retail-focused feature set and is an attractive solution for commercial touchmonitor needs. It is well suited for high use public venues where point-of-sale, point-of-information, point-of-service, shelf-level and countertop interactive digital signage and loyalty systems systems are found.The 1717L is offered with AccuTouch five-wire resistive technology, IntelliTouch surface acoustic wave, or iTouch pure glass surface acoustic wave technology. AccuTouch is widely used in retail and hospitality environments based on its proven ability to survive splashing liquids, food and grease. IntelliTouch and iTouch pure glass surface acoustic wave technology delivers the ultimate in optical quality for dry retail and hospitality applications.The optional 3-track magnetic stripe reader (MSR), programmable to either HID or Keyboard Emulation, is easily installed by the user, providing an elegant, integrated solution and eliminating the need for external brackets or attachments.The 1717L touchmonitor is environmentally friendly, lightweight and uses less power with state-of-the-art LED backlights in the display panel. 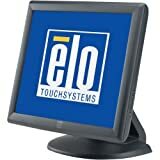 The 1717L touchmonitor is built to withstand the rigors of continuous public use with a rugged “built for touch” design. Its stylishthin and modern look is coupled with a retail-focused feature set and is an attractive solution for commercial touchmonitor needs. It is well suited for high use public venues where point-of-salepoint-of-informationpoint-of-serviceshelf-level and countertop interactive digital signage and loyalty systems systems are found. The 1717L is offered with AccuTouch five-wire resistive technologyIntelliTouch surface acoustic waveor iTouch pure glass surface acoustic wave technology. AccuTouch is widely used in retail and hospitality environments based on its proven ability to survive splashing liquidsfood and grease. IntelliTouch and iTouch pure glass surface acoustic wave technology delivers the ultimate in optical quality for dry retail and hospitality applications. The optional 3-track magnetic stripe reader (MSR)programmable to either HID or Keyboard Emulationis easily installed by the userproviding an elegantintegrated solution and eliminating the need for external brackets or attachments. The 1717L touchmonitor is environmentally friendlylightweight and uses less power with state-of-the-art LED backlights in the display panel.